ZOEY WASN'T LIKE THE OTHER CHICKENS. SHE HAD DREAMS. Clearly Zoey's eyes are on the skies. With a tiny satellite dish atop her space helmet, she is ready for launch. Well, not exactly. There are plenty of naysayers among her peers. Henry the napping hound yawns and opens his sleepy eyes. "I HAVE PLENTY OF SPACE RIGHT HERE." Pip the mouse is intimidated. "NOT DANGEROUS!" SAID ZOEY. "AN ADVENTURE!" Clara the cow points out that Zoey has no space ship. But to the ebullient Zoey, that's just an opportunity! She grabs an empty basket in the barnyard, and caught in an apple tree she spots a bunch of helium balloons. "ZOEY ALWAYS FINDS A WAY!" SAID SAM THE PIG. Sam has some reservations about leaving for outer space before lunch, but with pie in the back of his mind, he parks his trotters in the gondola of Zoey's spacecraft and they cast off for the stars. Their capsule rises above the trees. The view from space IS spectacular! Spread out below them are the farm fields and the baseball field, a game in progress. A pop fly sails by. Sam warns Zoey to steer away from a loose kite soaring by. But even when an attack of aliens (a.k.a., a flock of crows) proves the downfall of Zoey's space mission, Zoey proclaims their sudden touchdown in a truckload of corn to be a perfect landing and presents Sam with an appropriate reward. 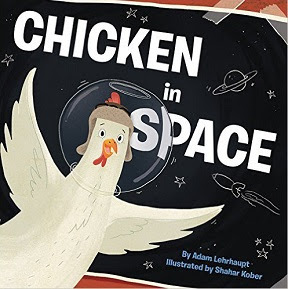 But while taking a bow to her public, the opportunistic Zoey is already eyeing an open sea chest in the corner of the barn, with an intriguing pirate hat and scimitar inside, in Adam Lehrhaupt's Chicken in Space (HarperCollins, 2016), and while Clara the cow may declare Zoey a bit spacey, youngsters will be happy to follow her into more adventures. You can't keep a good chicken down, and Zoey is one chicken who is sure to rise to the occasion. Much of the fun of this story comes from the clever illustrations of artist Shahar Kober, who zooms in on Zooey's prosaic barnyard buddies and zooms out for some eye-catching perspectives from our heroine's voyage to outer space. No need to worry that youngsters may be lured by this fanciful tale into ill-conceived space flights; author Lehrhaupt makes it clear that Zoey is all too aware that hers is mostly a jolly flight of fancy, the sort of game of "play like..." that kids love. "A fun story for inspiring positive thinking, problem-solving, and old-fashioned imaginative play," says School Library Journal.